Alciato at Glasgow: Emblem: In momentaneam felicitatem. Dicitur: & grandi luxuriasse coma. Se praestare aliis credidit arboribus. Protinus adveniet quae malè perdet hyems. 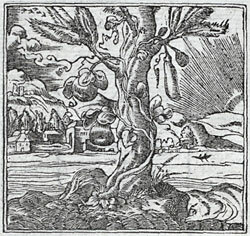 A gourd, it is said, grew beside a lofty pine and flourished with abundant foliage. When it had enveloped the branches and grown taller than the tree-top, it then thought itself superior to the other trees. The pine said to it: This glory is exceedingly brief. For winter will shortly come which will utterly destroy you.